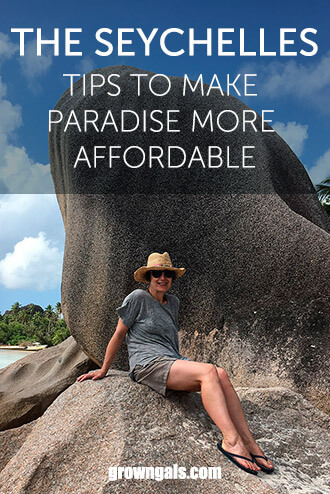 I love tropical adventures and this post is about how to experience the Seychelles, the ultimate island paradise, without breaking the bank. Don’t get me wrong – this is not a budget traveller destination and it was still a massive treat. To put you in the picture our budget was £2500 each, for two of us. We spent just under that to include flights, travel, car hire, food, accommodation, trips, spending money and even Heathrow Express when the tube was on strike. 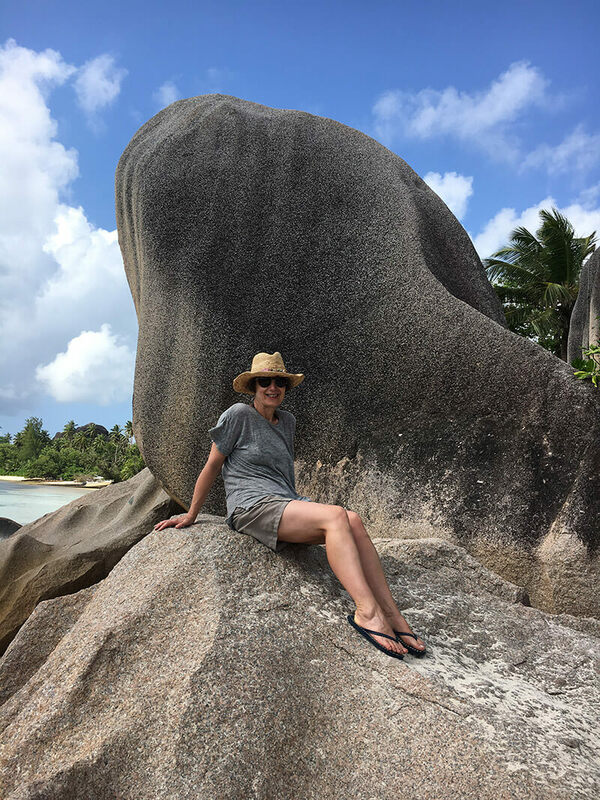 The Seychelles are breathtakingly beautiful; white powdered beaches, fringed with lush tropical forest and dramatic granite boulders. The sea is azure blue and our passion for snorkeling was rewarded with sightings of hawksbill turtles, a guitar shark and a manta ray. The Seychelles are in the middle of the Indian ocean, hundreds of miles from anywhere. 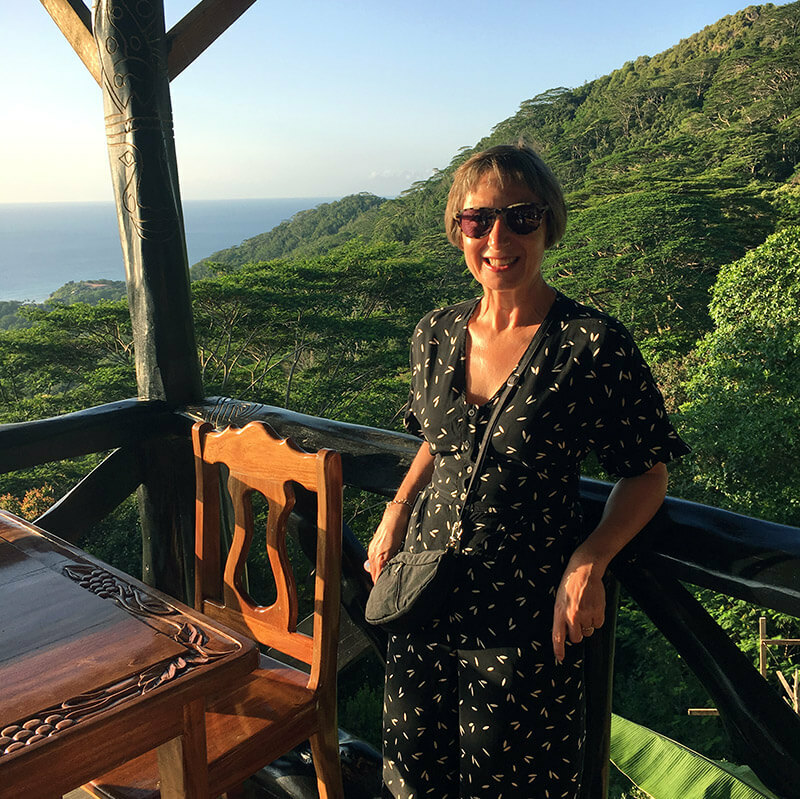 Flights are never going to be cheap – but British Airways now fly from London to Mahé in 10.5 hours and my tip is to splash your cash on flying direct. You arrive early which gives you a full day to get started. Research is easy online and I recommend exploring these websites: Seychelles.org, Seyvillas, Seychelles Travel and Seychelles Bookings. We booked ferry crossings, accommodation and car hire in advance. 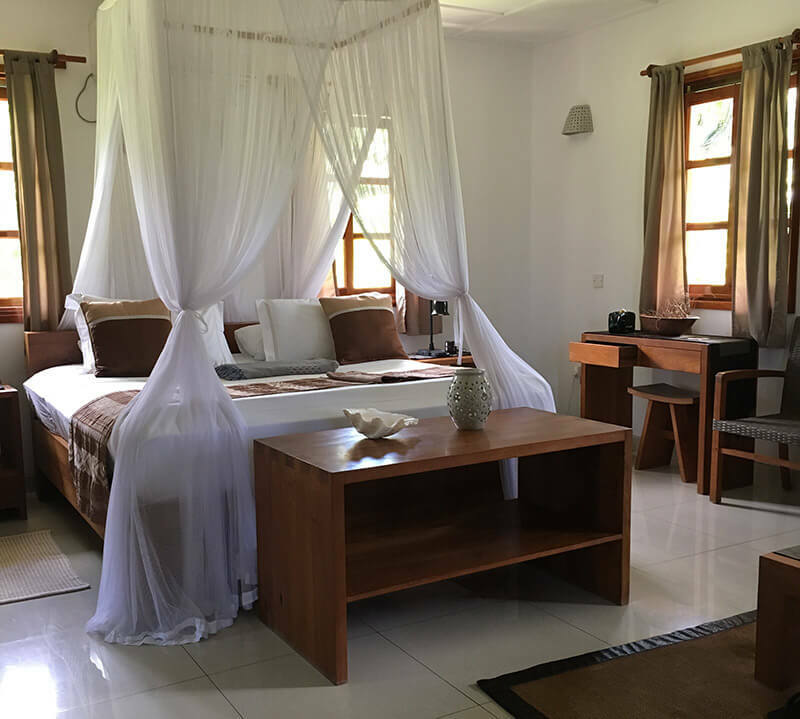 Some holidaymakers prefer everything to be organised for them but the Seychelles are completely set up for travellers and it’s very easy to do-it-yourself. Over 100 islands make up the Seychelles archipelago but most are protected as nature reserves or privately owned. Mahé, Praslin and La Digue are the three islands that most travellers visit. Creating an itinerary is essential in getting the most out of your time. We stayed 3 nights each on Praslin and La Digue with 4 nights on Mahé before returning home. This sequence made sense for us as first-time visitors and gave us the framework of our holiday. In order to cram in as much as possible we wanted to get straight onto the island of Praslin. There are two choices, a 20 minute flight or the ferry and there’s not much difference in the price if you book ahead. Our flight from London landed at 7.30am but economy flights to Praslin were already full three months before travelling. We booked the 10.30am Cat Cocos ferry instead, along with the 9am shuttle bus from the airport. We also pre-booked the Inter Island ferry onwards to La Digue three days later and the return trips. A word of warning, the ferry crossing from Mahé to Praslin was much rougher than expected and many passengers were seasick. The southeast trade winds of the Indian ocean can be very choppy. We’d envisaged sightseeing from the upper deck but the reality was no view at all through a plastic curtain protecting us from sea spray. Six days later the crossing back was much calmer but if you suffer from motion sickness take medication. You get to La Digue on a ferry from Praslin or by private helicopter. Whatever you do don’t miss this charming island for fear of seasickness – it’s just a twenty minute crossing and avoids the open sea. Hiring a car on Praslin meant we got to see everything in a few short days. First stop, Anse Lazio, one of the world’s most beautiful beaches, untrodden, early in the morning before the tours arrived. 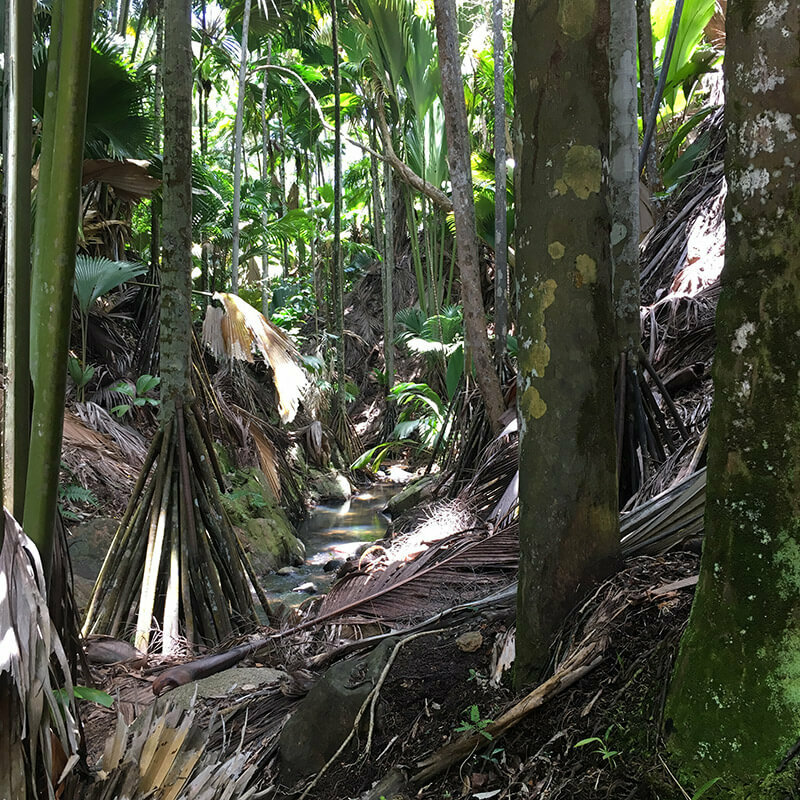 Next the trail at the Vallée de Mai which is an ancient palm forest and world heritage site in the centre of the island. Then we explored the coastline where every turn in the road reveals a new vista more breathtaking than the last. When we disembarked at the jetty in Praslin a smiling Shirley from Bliss car hire was waiting to greet us. We’d paid a deposit online and after filling out a few forms we took the keys of a Kia Piccanto along with the warnings not to park it under a coconut palm or get too much sand inside! Driving isn’t difficult, there isn’t much traffic and you drive on the left – but roads can be narrow, steep and winding. When you get off the main highway there are foot high drops at the either side of the road where it gives way to jungle. The anxiety of backing up in the dark to let a car pass, unable to see the road edge, proved too much for two urban drivers. Taxis are more expensive than they should be. Getting to or from the airport usually involves forking out for a transfer but apart from this we happily got around Mahé on local buses. Similarly on Praslin all the major routes are served by buses but if you only have a few days a car does come in handy. Part of the charm of La Digue is that everyone rides bicycles. Sometimes bikes are included with accommodation but rental shops are plentiful and inexpensive. Do a test ride, make sure the gears work and get one with a basket for your stuff. When we asked about a bike lock they just laughed. We cycled all over the island and loved it. I’d read that self catering apartments were good value in the Seychelles. Hotels are very expensive and all the little extras soon add up. We scoured Tripadvisor and Booking.com for apartments that ticked all the boxes: sea views, terrace, good location, wifi, snorkelling, walking distance to restaurants etc. Its important to read lots of reviews – not just the first few. Booking.com offer free cancellation on some properties so you can keep checking to see if a preferred rental comes back on sale closer to your departure date. 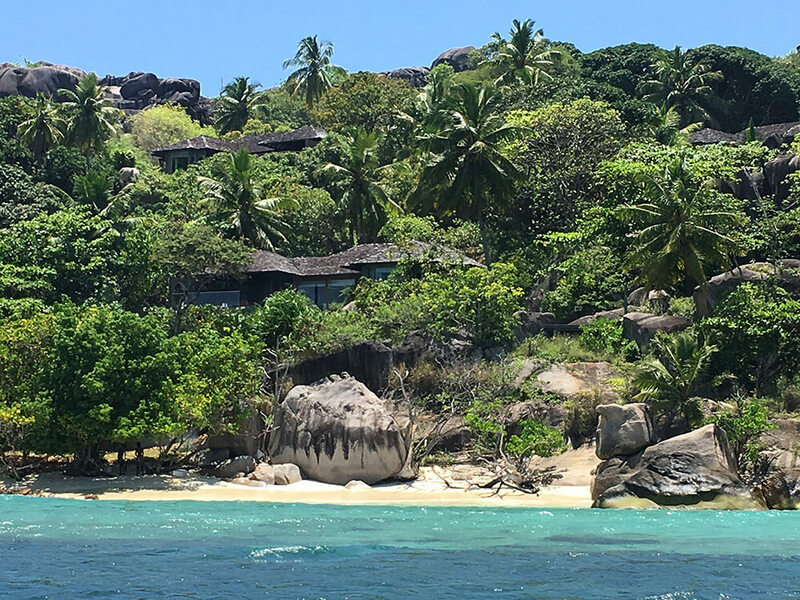 On La Digue we stayed in an apartment at Domaine Les Rochers and on Mahé at Beach Cottages – both were amazing. They gave us lots more space than a hotel room and they felt just as luxurious. You won’t need a swimming pool (which are environmentally unfriendly on these tiny islands) because the sea is warm, beautifully clean and free! We chose a guest house off the beaten track on Praslin and that was a mistake. The location was quiet and exquisitely positioned opposite a pristine beach. But it was reached along a winding and steep single track road through the jungle and after darkness fell at 6pm we were stranded. With no cooking facilities we ate at the guest house restaurant which was overpriced and underwhelming. Next time I would choose to stay closer to a village or on a main road and leave exploring nature for daylight. Traditional Creole cuisine is very simple: spicy coconut curries, grilled and smoked fish, fruit and vegetables. It’s delicious but incredibly overpriced if you eat in restaurants. Main courses can be over £25 for a bowl of curry. One of the best ways we found to sample local dishes was to frequent the ‘takeaways’. These little stalls and cafes cook fresh dishes daily with locals and tourists alike queuing to get served before the specials run out. Some provide tables and serve beer as well as food which makes for a fun and relatively cheap dining experience. If you find yourself on Mahé on a Wednesday evening visit the Bazar Labrin food market that runs alongside the beach at Beau Vallon. Stalls serve affordable Creole BBQ meat and fish, curries, fruit cocktails and beers. Spend the evening eating fresh tuna kebabs on the beach, watching the sunset and enjoying the party atmosphere. It’s a holiday so you’ll want to eat out occasionally. Do your homework ask your host and get advice from other travellers on where best to splurge. One memorable meal we had was at Snack Bellevue on La Digue which we booked through our host. Taxis arrived at 5pm to take us up to the top of the mountain in time for the spectacular sunset. We sipped rum punch and watched fruit bats flying through the tree canopy. As the sun finally dipped the Creole feast started. It wasn’t fine dining but it was tasty and a truly a unforgettable experience. Self caterers can buy fresh fish, fruit and vegetables cheaply at the markets. The covered market in Victoria is an experience in itself and really worth devoting a morning to. A piece of tuna that could feed a family cost just £3. In the nearby streets you’ll find French bakeries and supermarkets for essentials. Mini-markets are everywhere but the choice is limited and basics are expensive because so much of it has to be imported. Our apartments included essentials and on La Digue we were provided with a generous bowl of exotic fruits. I’d taken some filter coffee sachets with us and this made all the difference at breakfast time. When we next visit the Seychelles I’ll pack plain flour (hard to find for banana pancakes) herbal teas, pesto, olive oil, dressing and as many treats as I can. Don’t forget to pick up your duty free allowance so you can enjoy cocktails on your terrace – perfect with the salty plantain fries that are sold everywhere. You might even find a BBQ included with your rental. The perfect crescent of Anse Lazio beach on Praslin (go early and snorkel to the right behind the watersports shop). 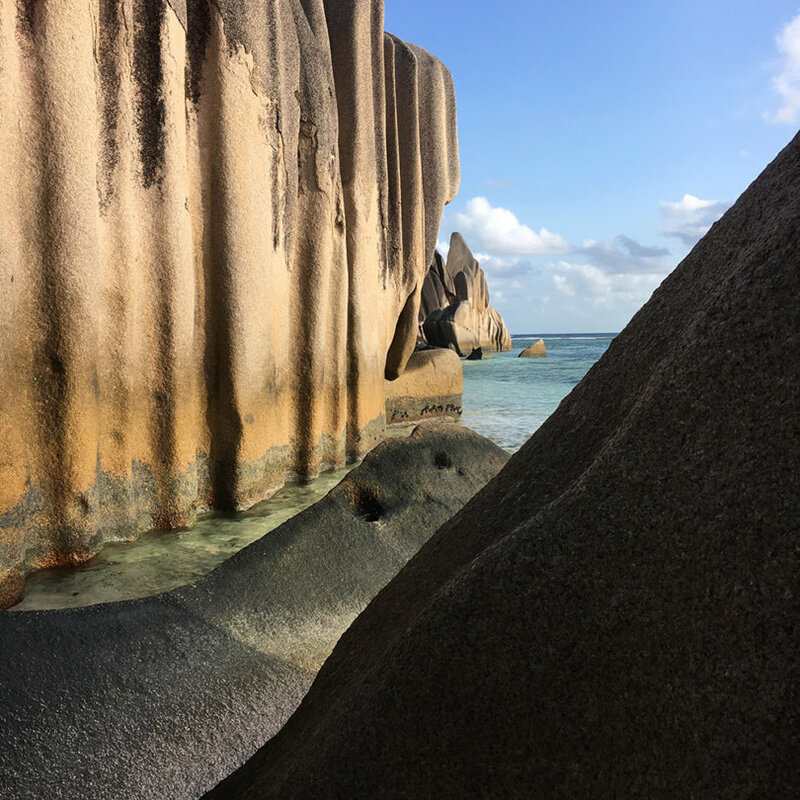 The stunning coves of Anse Source d’Argent on La Digue where we watched a turtle feeding on sea grass in a few feet of water. A guided snorkeling trip off La Digue with Lizzy boat charter. Hiking the trail to Anse Majore on Mahé and being rescued by the boat taxi Happiness when the tide came in. Cycling to the other side of La Digue and spotting a drenched bride and groom having their pictures taken in the crashing waves. The spectacular sunset from Snack Bellevue on La Digue. Bird spotting in the palm forest on Praslin. Walking the length of the beach at Beau Vallon to get supper at La Perle Noire and Baobab Pizza. Watching a heron fish at low tide from our balcony. You can pack every moment with adventure but this, of all places, is somewhere to stop, relax and contemplate a different pace of life. We are lucky (and old) enough to have experienced many destinations before they became popular. There are not many places we would return to but the Seychelles are special and we will definitely come back. I didn’t want to tell you about it at all… but I just can’t keep a secret.